It takes me about seven hours to complete each comic page. That’s a lot of work! I definitely love it, and I don’t mind doing it all for free. But if you’re able to give a little something back, for an interesting reward… that’d be cool! …Also just wishing Victor a happy birthday is nice too. @Victor: Happy B-day in three days! Judging from panel three, wow, Bladud is short. Judging from panel eight, wow, Bladud’s tail is long. Oh cool, the sword has slots for two gems. If Skærva can find a couple magical non-horcrux gems, he can double up on the magical power, and have it all be his. So does that imply that Bladud’s presence is counteracting the god’s ability to make Skærva’s plans go awry, or maybe that if Skærva had given into the temptation it would have been playing into their hand? Were Bladud and the First around near the same time? That seems like a red rage there. Bladud’s heyday was during the Second’s lordship. But I was thinking if his ghost and the First met up, that’d be a party! …They’d hate each other. Happy Early-Birthday, Lego Man! May you get many legos and not step on any of them. Don’t worry, Victor would never leave a LEGO brick just lying around where it could be stepped on. Also, because Shadow might chew on or eat it. ZOMG!!!! It’s like that part in a game where it changes control from the protagonist to the “original” boss the fight the “real” boss!! Squeeeeeeeeeee! Or: rival team up time!! More squeeeeeeeee! I do so love those begrudging rival team-ups to fight a greater threat. Super Mario RPG and Super Paper Mario being my favorite examples that come to mind. Oh, and happy early birthday Victor! I would look at your Patreon, but to my knowledge that requires money and means to transfer it over the internet, so I don’t think I can help. Woah! I totally forgot about the pixel art smilies. That makes it a little too happy for an apology, but it looks cool. It’s cool! I understand that most people won’t be able to contribute, and I definitely don’t want to close off anything important story- or worldbuilding-wise to those who can’t. Just extra drawings! Of course. As we’ve seen before, there’s nothing the Fourth wants more than for the name Skärva to carry the respect and fear he feels it deserves, or more accurately, to prove that it deserves that respect and fear. It’s interesting seeing the chain of events through the generations that lead to Skärva having the outlook he does and how central the curse really is to it all. We can only guess at how the First reacted to being cursed and what kind of father he was, but it certainly didn’t result in the Second having a healthy attitude towards it. The Third grew up seeing his father drive himself to madness over it and was determined to have it be a positive force in his life, leading to him embracing the “evil shark man” image his appearance lent itself to in order to benefit his subjects. Meanwhile Skärva grew up seeing his father constantly get beaten and never really understood why, leading to him coming to the conclusion that his father was just weak and seeing the curse as an obstacle to be overcome. You understand the relationship dynamics through the generations really well. I hope you enjoy when we get to explore them in more depth in the future! Especially when we add in the factor we haven’t shown yet at all: moms. Bladud: … wha-what are you DOING!? Skarva: I don’t have a track for this!!! Skarva: Not a WORD from YOU, boy wonder or I’ll SMACK, CRASH and KAPOW you to next Tuesday. Bladud’s emotional range in this page is really entertaining. Nice little twist you’ve got going here. So, it seems that Skärva is about to switch sides in this fight–interesting! Well, I think that we can safely say that much about this fight has been very fishy. 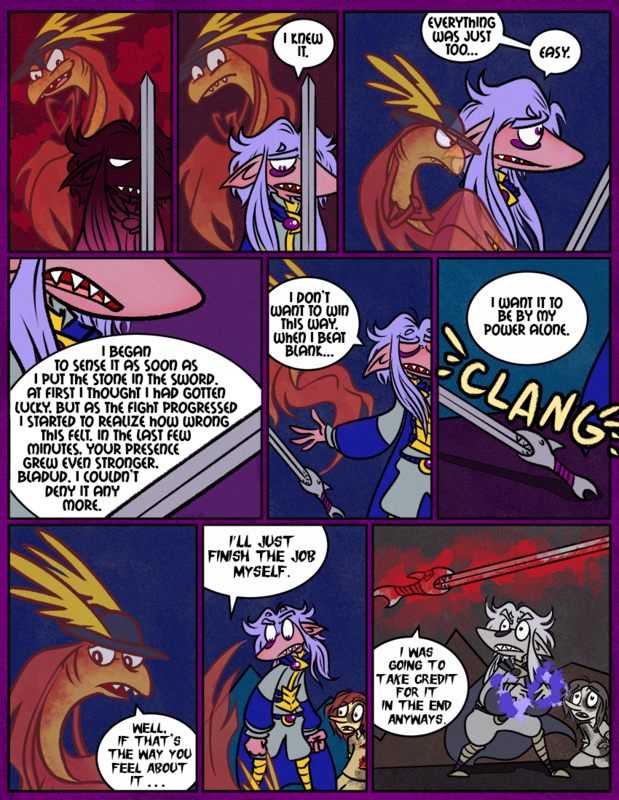 On a similar note, I like that in panel four the sword cuts (so to speak :P) the curve of Skärva’s speech-bubble. Does Skarva’s curse prevent him from dispatching of an evil power? A “Timed Battle” between the hero and villain until the True/Secret Boss appears – which might involve a hero-villain teamup? Best twist ever! C’mon, Boss Skarva! You’re too awesome to be Hijacked By Ganon! I’m glad to see Skärva had his own honor code. Kind of? Or I guess he just wants to do it himself cause he’s stubborn. Even if it means defending Blank. OH MY GOSH THIS IS THE BEST WAY THIS COULD HAVE GONE. YES GOOD. TEAM UP AGAINST THE BIGGER MORE JERK VILLAIN.